Start Where You Are, in Opelika Alabama? 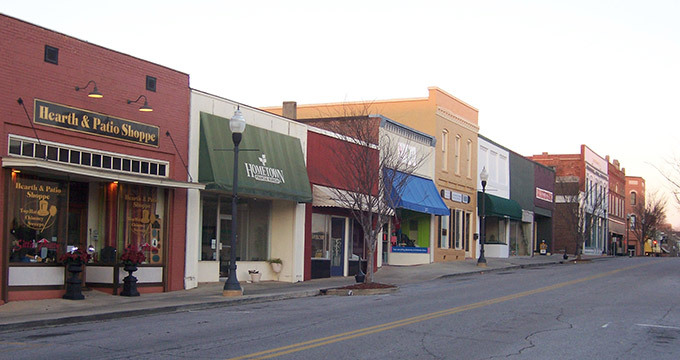 Just a stone’s throw away from Auburn Alabama sits the city of Opelika. Opelika is rich in heritage in history dating back to the mid 1800’s. The city grew to prominence during the time of the civil war where Opelika served as a major depot for confederate supplies. Opelika also served as the main provider for confederate uniforms during the civil war. It was Opelika’s central location along the railroad that caused the city to grow and become a commerce center at the turn of the century. Fast forward to today and the city, led by Mayor Gary Fuller, lives by a motto “Rich In Heritage With A Vision For The Future” and that’s just what’s happening there. Downtown Opelika looks like it could have been set in an old style western. Depending on who you talk to, that was just what Opelika was like in the early part of the 1900’s. “Opelika’s downtown was packed with saloons, and frequent gunfire in the streets led to railroads ordering passengers passing through Opelika to duck beneath the windows to avoid being shot.” The city’s Wikipedia entry says. Now industry has found it’s way back to Opelika. The 1990’s saw a major industrial boom as well as a boom in retail with the addition of a large shopping area called “Tiger Town” which many often mistake for being part of Auburn. What makes Opelika even more future focused is their “fiber loop” just like Chattanooga Tennessee, Opelika’s power services turned to a new infrastructure two years ago and installed new metering systems that operated on a 1gb fiber loop throughout the city. The city owned utilities offer digital video along with data services on this blazing fast internet. It’s the kind of internet that helped grow Chattanooga’s Gig Tank and the startup initiatives around it. “As a Startup America Regional Champion for Tennessee, I saw first hand the transformation of Chattanooga into the Gig City”, Kyle Sandler, serial entrepreneur, Startup America Regional Champion, and founder of nibletz and the Everywhere Else movement said. “companies gravitated toward Chattanooga for it’s culture and it’s extremely fast internet, the town embraced startups”. Sandler, who participated in the first three years of Gig Tank said. “Opelika has the same appeal, it’s a very creative and cultured town, now add in what the community leaders are doing with downtown coupled with the internet and it’s the start of something that could be just as big as Chattanooga” Sandler said. After launching and successfully exiting out of multiple startups, participating in two incubators and serving as a startup steward and advocate, Sandler is opening The Round House in downtown Opelika, a startup space that will feature co-working, an incubator program, a rolling accelerator and a cohort based program as well. “There’s a lot planned for Opelika and Round House will be on the cusp, helping to grow new companies that will stay and grow into the culture and community spurring in the city” Sandler said. The location on South 8th Street in downtown Opelika had a soft opening last week and the Round House is planning a big grand opening on the first Friday in December, with the regions first ever 50 hour launch weekend event that’s Round House is dubbing “Startups First” Traditionally the first Friday in Opelika downtown merchants stay open later to spur activity in the downtown area before folks head out to dinner, at the Round House will stay open through Sunday evening building ideas into new startups, Startup Weekend Style.